I’ve spent a lot of time trying to work out how not to get wet feet when I use the Xtracycle in the rain: I guess that’s one result of not having a television. I could just go out and get a nice Brooks mud flap, but I figured that if other people can do stuff like make mushing belts from inner tubes I can at least try a mud flap, so a couple of weeks ago I spent a half hour in the garage and came up with this low- cost version using a mountain-bike sized inner tube, some tyre repair glue, and a couple of odds and ends. To make it a bit tougher and stop it curling, I used two pieces of inner tube back to back with puncture repair glue: since getting puncture-proof tyres I hardly use this for it’s intended purpose anyway. I’m not sure how well that’ll work long term, but I can always try again with a different glue if it falls to bits. I drew the outline with a pen on the glued-together tubes and cut it out. So far it’s holding up to the rough treatment I give it. In service it is about 6 cm/2 inches above the road which is low enough to keep me from getting spattered. I didn’t get it quite level and there’s a gap at the top so some water runs down the back. Maybe I’ll do something about that one day. 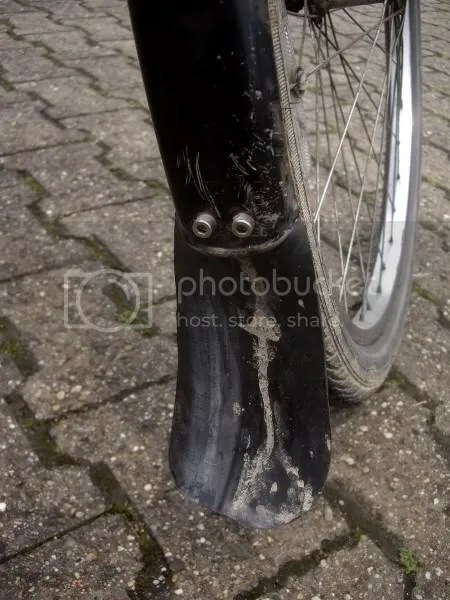 I fitted a ( readymade, admittedly ) mudflap which was not designed to clip to the front mudguard on my Yuba, by drilling and pop riveting the flap on to the plastic mudguard. Hi Phil- thanks for dropping by. 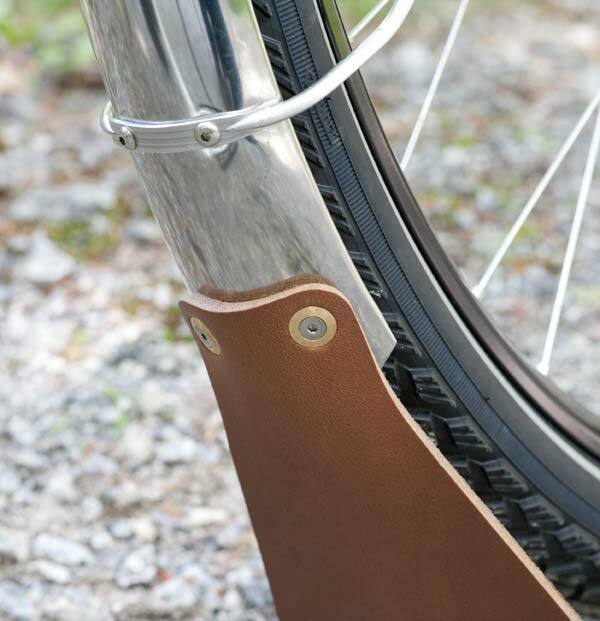 You drive a Yuba in Bristol? Much respect. I wondered about doing that but I was worried I’d damage the mudguards when I had plastic. Now I can drill and run bolts through them without worries. I make mine from leather, old plastic jugs, and the best stuff I have found is stair cover. The stair cover stuff is similar in weight to the plastic used to make car floor mats, but a bit stiffer. Never tried inner tubes before. Wow, that’s a neat construction. I like such DIY stuff a lot. 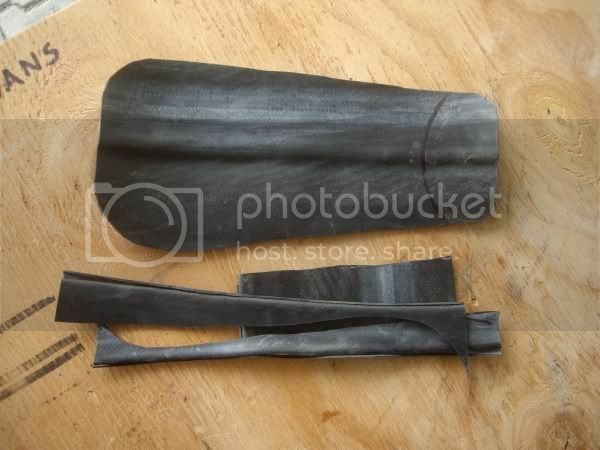 Obviously, we would have big problems if we ever ran out of spare inner tubes. Thanks North Mark. I have a (small) stockpile of stacked in a drawer just in case of some future apocalypse. Not sure what circumstances would lead me to need 30 assorted inner tubes, but you never know. Interesting stuff here although I threw out an Old Inner Tube that was worn out a long while ago now. I have a different problem that an Old Inner Tube might fix. I have got a new Bike for Touring,it is a Dawes Audax and it is a marvelous Bike but I discovered that the Drop Handlebars beside the Stem is to Thick to hold the Band that attaches to the Light Bracket. If I go along the Bar where it is Taped it could interfere with the Brake Cable which runs through the Tape. So I need to make some kind of Holder for the Light Bracket to either attach to the Bars or the Bar that attaches to the Stem. I suppose I could use an Old Belt cut down to 2 or 3 inches and stick it with Super Glue to the Light Bracket and then attach it to the Bar where it meets the Stem or else do the same with Inner Tube. If I cannot find one that is Commercially made I will have to try something like this. Hello Jack, thanks for dropping by. Your problem sounds like an inner tube would be a good solution. Have a look at the link North Mark put in his comment and see if that sparks some ideas. I had a look and that Solution for the Maglite,whereby he put two Holes in a short Strip of Inner Tube and Put it around the Handlebar and Wedged the Front and Rear of the Maglite Through both holes was a very simple but Effective Idea. I have three Lights and one of them will work using this Idea because it is narrow like the Maglite but the other two it wont because they are more Blocky. The newest Light is a Cateye and is Blocky and has a very bright light and would be Great for those Dark Country Roads but it wont fit the New Bike with this Method. It is a pity they do not give you several Methods of attaching Lights to Bikes. Although I have seen a Bike the other Day with the same configuration as mine and they have the Light on the connecting Bar between the Handlebar and the Stem Attached with two Zip ties through the Light Bracket and then around the Bar. If I can get a piece of a Belt I could attach the Bracket to that and be able to put it on the Bar, I have several Ideas I can try out for the Cateye. Thanks Mark and Andy for the Maglite Idea.